When I’m not flipping the pages of home-grown publications, I turn to Wallpaper, Veranda, Elle Decor, Architectural Digest, Luxe Interiors + Design and House Beautiful. AD offers not only visual inspiration, but stories such as this one about how owners of an incredible Malibu home rehabilitated the property after a tragic fire. I love Elle Decor, too, because they combine human interest with art and design. I don’t know if you noticed, but personality is a big part of my design process! Remember how I mentioned that Pinterest and Instagram were great sources for inspiration? Take that impulse even further by checking individual blogs and social platforms. Individual bloggers like Amber Interiors (blogger turned designer) offer unique perspectives outside the more traditional design world. The Jungalow gives me inspiration that fuses design and art (plus a little fun, too). Speaking of fun, Emily Henderson is just fabulous. I love her quirky approach to interior design and her tagline: “Perfection is boring; Let’s get weird!” She also has features where she breaks down an entire room by piece, price, and style. As someone who has worked with all kinds of clients, this is kind of like an exercise to keep my wits sharp and a creative way to brainstorm, too. Design Milk features great office inspo with spotlights on how various designers interpret workspace. On the other hand, Design Sponge is the perfect repository for thought pieces and stories of transformation. The piece about “breathing new life into vintage pieces” reminds me of House + Town and how much I absolutely love a refurbished classic piece. Travel can be a huge inspiration when it comes to interior design. Outside of the main architectural attractions of Spain and Italy, Mexico and Columbia, hospitality designs speak to me. I love hotel and restaurant design and seeing the use of mixed materials, colors or patterns, and statement pieces sparks new ideas for my own clients. Pictured above is one of the many unique and one-of-a-kind design shops in Barcelona. One of them — Sit Down — is inspiration on two fronts: chair design AND cute puns! High Point Market is rapidly approaching with key-note sessions from several designers such as David Hicks and Paula Wallace. A little closer to home, Dallas Market opens up shop in late October. One of my all-time favorite events — ICFF in NYC — is a hub of contemporary design and new ideas with more than 35,000 design professionals. We’re talking interior designers, architects, distributors, manufacturers, and more. 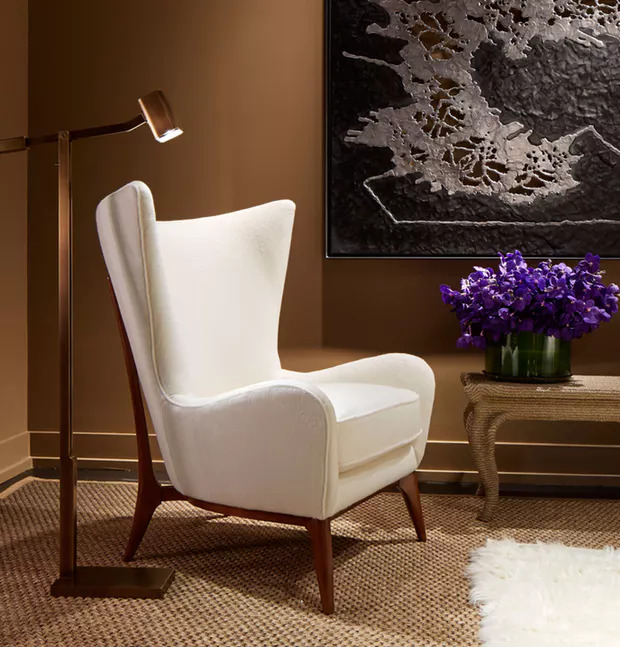 The best news: it’s open to the public, too, and you can hit the Kips Bay Show House at the same time of year. I also make trips to Las Vegas markets, too. Strictly for interior design purposes only of course! (I know you’ve already imagined the “wink” emoji in your mind when I said that). Speaking of Kips Bay… Similar to going to an art gallery, I draw inspiration from show houses. When you see an entire concept realized (even if only for show), it can awaken new ideas and associations. I can access dozens of Luxe Interiors and Design home tours online for quick inspo whenever I need it. When I need something more visceral, I keep things local with the Pink Ribbon House for French countryside vibes. Something about being in a space imbued with design energy sparks my creative flame. I remember this statement piece from a custom furniture maker, then I think of a custom neon sign from The Neon Gallery in Houston. All of a sudden, a space is taking shape in my mind.